Northern Electrical Engineering Consulting Company (NEECo) is a full-service electrical engineering design firm based in Anchorage, Alaska. NEECo focuses on oil field construction and other industrial projects, as well as commercial buildings, street lighting and traffic signal design. Much of NEECo’s commercial work consists of design/build projects done in partnership with electrical contractors. Jim Parker, PE, NEECo’s principal and founder, first purchased Design Master Electrical in May, 2002 and has been using it with great success ever since. “This is a small company – just myself and a junior engineer,” says Mr. Parker. “But we produce more jobs than firms three or four times our size. That’s mainly because the decrease in design time made possible by Design Master Electrical is just astounding. “We’ve extremely fast at producing commercial buildings with Design Master,” continues Mr. Parker. “But I also use its photometric features intensively. For example, I just completed the lighting design for five miles of cross-country ski trails, and I have two similar projects coming up." The ski trails are only fifteen feet wide and have a lot of bends in them. For the first project, Mr. Parker manually created a 0.1 footcandle contour using a polyline. He copied the polyline along the trail so he could see the area each light would illuminate and optimize the spacing between them. In the latest release of Design Master Electrical, the software draws the contours automatically when you insert a light fixture. This new feature will make positioning the light fixtures faster and easier than in the first project. That is just one example of how the Design Master is continually improving its software. “I also use Design Master for traffic signal design. I set up the blocks in Design Master to help automate the layout of all the traffic detection loops and signal heads. I have two different setups to meet the differing requirements of the municipality of Anchorage and the Alaska Department of Transportation, and the software keeps track of the layers for me. Design Master is very flexible so you can extend it to meet your specialized needs,” Mr. Parker describes. Another reason NEECo is so successful is Design Master’s contribution to its design/build porfolio. “I’ve got over a dozen contractors who use me pretty much exclusively for engineering work,” states Mr. Parker. “I was a journeyman electrician before I got my engineering degree and I’ve also had an electrical administrator’s license. Since my background is in the construction industry, naturally I work with the contractors very closely. “When NEECo teams with a contractor, we can use Design Master to quickly rough out a design that includes light fixtures and receptacles and service equipment sizes, so that the contractor knows what their money items will be when they bid on the job. Typically a design/build contractor will get one in five or six of the jobs they bid on. We generally pick up one in two or one in three. That’s because Design Master lets me give the contractor a much more accurate quantity list, so he in turn can estimate accurately how much material and labor will cost. One feature that the contractors really appreciate is that Design Master schedules have the quantities of the lights, receptacles and switches included. They still do their own material take off, but they have found that if there is a discrepancy, the drawings are almost always correct. 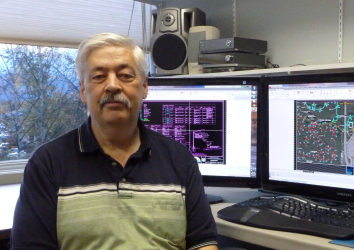 “I don’t get underbid by other engineers very often; I’m very cost-competitive. And the contractors know this and that’s the reason I have so many contractors use me for their engineering,” Mr. Parker explains. Besides facilitating sharper bids, Design Master also streamlines the plan review and construction processes. “Once we’re the successful bidder on a project, we’ll use Design Master to quickly complete all the circuitry and do all the panel schedules, so the contractor has a polished set of drawings that he can work with, and that will make it through the Municipality of Anchorage plan review process,” Mr. Parker states. “There are fewer errors on our drawings because the software does such a good job of tracking all the circuits and tabulating the loads. Some of the drawings I see from other firms don’t have the circuits labeled accurately: they’ll duplicate circuit numbers for two incompatible pieces of equipment. Those issues just don’t happen with Design Master, so we get far fewer requests for clarification. “For example, just last week I was remodeling a restaurant and the previous engineer had applied a 65% load factor to the entire panel because he could not separate the kitchen equipment loads from the lights and receptacles. Design Master provides a means to apply the load factor to each piece of kitchen equipment,” adds Mr. Parker. Thanks to the greater design efficiency that Design Master Electrical affords, NEECo is able to do far more work in less time. Design Master also gives the firm a major competitive edge in design/build bidding situations, which has led to more opportunities, more successful bids, and a much higher percentage of successful bids. As a result, NEECo is both more profitable and has a higher net income. Part of the reason the software works so well is that Mr. Parker and many other engineers have personally contributed suggestions for new features, and have helped beta-test previous versions. “In the early days I posted more suggestions on the website than practically anybody,” Mr. Parker recalls. “It really impressed me how fast Design Master would take one of my suggestions, incorporate it into the software, and send out an update. Likewise, if I flagged an issue in a beta version, typically the next day or so I’d get an updated file with the issue resolved – they responded amazingly fast. “When I first got Design Master I was comparing it to AutoCAD MEP, and Design Master was just the hands-down winner. Really there was no comparison: Design Master is designed to help automate engineering work for buildings, and it’s very efficient at doing that. With AutoCAD MEP, you have to create practically everything yourself. Design Master Electrical was much more polished than its competition even back in its early days, and it’s left the Autodesk software even further behind since.